William Garratt was a merchant and distiller in Kingston, ON. His distillery was sometimes called Distillery Yard in public advertisements, and sometimes just Garratt’s Distillery, as seen in an 1831 issue of the Kingston Chronicle where mentioned as adjoining a potash factory. 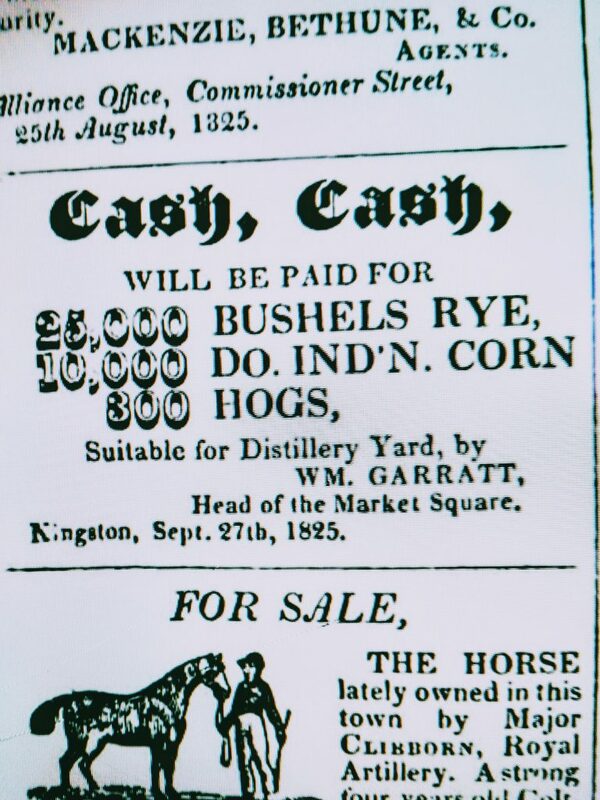 Below is an ad, dated 1825 but appearing on August 11, 1826 in the Kingston Chronicle, soliciting in this case (only) rye and corn to make whiskey. The hogs mentioned are in reference to Garratt’s use of the spent mash of the still to feed livestock for market. Livestock management was a frequent accompaniment to distillery operations in early years. The “piggery”, as termed in some reports concerning Garratt, got him in trouble later as some citizens did not like the noisome results of an animal pen in their city. Sometimes, Garratt’s ads request delivery at “Market Square” in the city centre, and a market still operates there in summer at least. Sometimes Distillery Yard is specified, or both. He may have moved his locations over the years. I believe this Garratt is the same as that of the grocery firm Cullin & Garratt. The distillery likely emerged from rectifying whisky onsite, just as Hiram Walker rectified wheat whisky in Detroit at his grocery before moving into distilling. (F.X. Chauvin of Windsor, ON wrote an excellent study of Walker’s career in 1927 as an academic thesis. It is now available I understand in published form, but in any case can be read in its original form online. The work is most instructive on this early part of Walker’s career, indeed on Hiram Walker in general including the origin and characteristics of Canadian Club). Ads by Garret for corn, rye, and other grains appear regularly in the Kingston press for at least 10 years from 1825, I did not check after. To the best of my knowledge, Garratt descended from a Loyalist family who arrived in Kingston in the 1780s. These ads don’t prove corn was grown around Kingston, a port which could have received shipments of this grain from the U.S. Given, though, other ads in the same period elsewhere in Ontario requesting rye and corn for distilling, it is highly likely it was grown locally. In any case, it obviously was used to make whisky in Garratt’s distillery. A number of American distilling texts recommend varying combinations of rye and corn to distill whiskey in the first quarter of the 19th century, Samuel M’Harry’s is one. 2:1 rye to corn is one of the recipes he discusses. Grain composition for liquor (anywhere) would have varied with price and availability, but clearly both corn and rye were used in Ontario whiskey for many years before 1840. Note re image: the image above was sourced from the Kingston Digital site linked in the text. All intellectual property therein or thereto belongs solely to the lawful owner or authorized user, as applicable. Image used for educational and historical purposes. All feedback welcomed. awesome story… are you going to do one on Morton of Kingston?? Thanks, I did discuss Morton before I think, will check though and advise. Not sure I’ll be able to find more, there is probably more available in local histories for Kingston and area. Try the public library in Kingston and ask for some tips, usually they are very helpful. I’ve seen now numerous ads for Morton Family Proof and other Morton whiskies, a search under those terms in the Kingston Digital resource will pull them up. There was Morton Family Proof (maybe 43% abv or perhaps 37%), a Proof itself which perhaps was 57.1% being the old Imperial or Sykes proof, and a rye whisky (at least). I think maybe a malt whiskey too. Using the Morton name in combination with whisky and proof should pull them up in newspapers listed in the Kingston Digital resource, the place I got the other ads from.